On this page we will walk through the spring 4 and quartz 2 scheduler integration annotation example using JavaConfig. Spring provides MethodInvokingJobDetailFactoryBean and SimpleTriggerFactoryBean to schedule simple job. We have to create bean for these classes in JavaConfig. The job class and method name are configured with MethodInvokingJobDetailFactoryBean and this bean is configured with SimpleTriggerFactoryBean and SimpleTriggerFactoryBean is finally registered with spring SchedulerFactoryBean in JavaConfig. For complex job where we need cron-expression, we use spring API JobDetailFactoryBean and CronTriggerFactoryBean in JavaConfig. Using JobDetailFactoryBean, we can pass the parameter to Job as well. While creating Job class, we need to implement QuartzJobBean and override executeInternal() method and create setter method for the parameter which will be passed by JobDetailFactoryBean. Here we will discuss complete example step by step. We are using software and tools as follows in our example. Find the gradle file for spring and quartz. Find the JavaConfig to integrate quartz with spring. We are configuring two triggers for the demo, one is simple and another is using cron-expression. Spring provides MethodInvokingJobDetailFactoryBean that exposes org.quartz.JobDetail. While creating job class, it will not extend any quartz job interface and we need to configure the executing method name to JavaConfig. Create bean for MethodInvokingJobDetailFactoryBean and configure job class name and method name to execute. To provide job class, we have three methods. setTargetBeanName(): Accepts job bean name. Use it if our job class is spring managed bean. setTargetClass() : Accepts class name. Use it if the job class has static method to execute. setTargetObject() : Accepts job object. Use it if job class has no static method to execute. Find the code snippet to configure MethodInvokingJobDetailFactoryBean in JavaConfig. The spring API SimpleTriggerFactoryBean uses org.quartz.SimpleTrigger. Create a bean for it in JavaConfig and configure JobDetail using MethodInvokingJobDetailFactoryBean. Configure start delay, repeat interval, repeat count etc as required. This trigger will schedule the job after 3 seconds and repeat after every 30 seconds for 3+1 times. 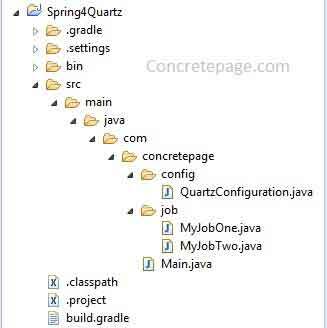 Spring provides JobDetailFactoryBean that uses org.quartz.JobDetail. We use it to configure complex job such as job scheduling using cron-expression. Create job implementing QuartzJobBean interface and configure to JobDetailFactoryBean. We also configure job name and group name. To pass the parameter to job, it provides setJobDataAsMap() method. Spring provides CronTriggerFactoryBean that uses org.quartz.CronTrigger. CronTriggerFactoryBean configures JobDetailFactoryBean . We also configure start delay, trigger name, group name and cron-expression to schedule the job. This trigger will schedule the job after 3 second and will repeat after every minute. Spring provides SchedulerFactoryBean that uses org.quartz.Scheduler. Using SchedulerFactoryBean we register all the triggers. In our case we have two triggers SimpleTriggerFactoryBean and CronTriggerFactoryBean that are being registered. We are creating a job that will be scheduled using SimpleTriggerFactoryBean. This is a simple job class where we can create static or non-static method to execute. The class and the method are configured with MethodInvokingJobDetailFactoryBean. Find another job class which is implementing QuartzJobBean that is simple implementation of Quartz Job interface. We have to override a method executeInternal() that is called when the job is scheduled using CronTriggerFactoryBean. If we want to persist the changes in JobDataMap, we will annotate our class by @PersistJobDataAfterExecution and if there is more than one trigger which are scheduling same job then to avoid race condition, we have to annotate our job with @DisallowConcurrentExecution. In our example our job is being used by only one trigger, so not needed to annotate it here. To pass the parameter to job by JavaConfig, we can have setter method and the property should be configured with setJobDataAsMap() in JobDetailFactoryBean configuration in JavaConfig. We can also fetch the parameter using JobDataMap as usual in Quartz job. I have used both scenarios in our example. Find the main method to test the application.